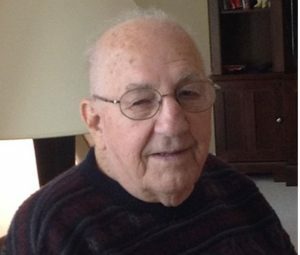 FULTON, NY – John J. Mieczkowski, 96, of Fulton, passed away peacefully on Sunday March 17, 2019, at Seneca Hill Manor, Volney. He was born in Syracuse, NY, to the late Stanley and Sophie (Szymanowski) Mieczkowski. Mr. Mieczkowski had been a resident of Fulton for most of his life. He was a United States veteran having served in the Army during World War II. Mr. Mieczkowski was a recipient of the following decorations and citations: European-Africian Middle Eastern Service Medal, Good Conduct Medal, Purple Heart, World War II Victory Medal and the Order of King Albert Forraugerre. Mr. Mieczkowski retired from Black Clawson where he worked as a machinist. He was past president of the Fulton Bowling Association, a former communicant of St. Michael’s Church, Fulton, and an inductee of the Fulton Bowling Hall of Fame. Mr. Mieczkowski is survived by his wife, Shirley Mieczkowski of Fulton; their sons: Stephen (Lynn) Mieczkowski of Martville, NY., and James (Roberta Morgan) Mieczkowski of Liverpool; six grandchildren; two great-grandchildren; and several nieces and nephews. Calling hours will be held 9 to 11 a.m. Wednesday at the Sugar Funeral Home, Inc., 224 W. Secnd St. S., Fulton. The funeral service will follow at 11 a.m. in the Sugar Funeral Home, Inc., Fulton, with Deacon Nick Alvaro officiating. Burial will be held in the spring at St. Mary’s Cemetery, Fulton. Contributions may be made to the Syracuse Disabled American Veterans Transportation, Syracuse VA Medical Center/Attn. DAV/HSC Room A174A, 800 Irving Ave., Syracuse, NY 13210. Sorry about your dad Steve and Jimmy.